Doc Hammer (also known as one of the creative minds behind the Cartoon Network show The Venture Bros.) brings us his new album, Alate. It was the #1 seller in our webstore in June. Merging Doc’s husky croon, post-punk guitars and catchy 80’s bass-lines/synths, WEEP creates a dark yet satisfyingly upbeat pop album painted by WEEP’s passion and unflinching take on contemporary music. 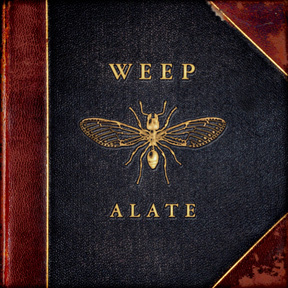 Alate, written and produced by WEEP’s guitarist/vocalist Doc is the perfect epic follow up to WEEP’s impressive debut, Worn Thin (PRO243, 2010). Taking us on a sonic journey through thunderous drums, wailing vocals, grand ballads, raging guitars and everything in between, the album is fused together perfectly: melodic, driving and catchy. Alate teems with dark distorted anthems for the modern age. The album positions WEEP as successors to the likes of Echo & The Bunnymen and The Cure, up through guitar bands such as The Smashing Pumpkins and Placebo, then on past White Lies and Interpol… ’til eventually WEEP is compared with only one sound: WEEP. Alate takes the listener confidently through eleven future classics. Huge guitars, huge drums, and huge choruses work to create a sound that moves the listener through WEEP’s epic creation. 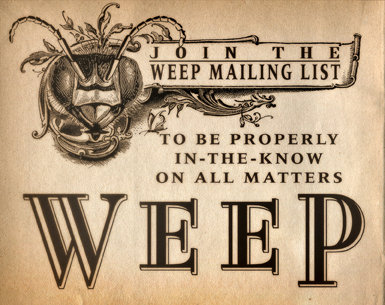 As timeless as it is contemporary, WEEP screams in brooding pop and alternative rock languages to create something that, in its strength, has the ability to sound fragile and even a little delicate. As a vocalist, Hammer finds his voice on Alate. What was once a somber murmur has become a growl that confidently pilots the drama within. Doc’s voice has developed into a controlled yell that even dips into a croon when necessary. Throughout Alate his voice is assured enough to be beautiful. From the dark, yet strangely upbeat pop sound of the opener “It’s So Late”, all the way through to the ballad-like closing track “Alate Ardor”, WEEP infuses Alate with a dramatic new energy and assertiveness.